What if the 1811–1812 sequence happened today? 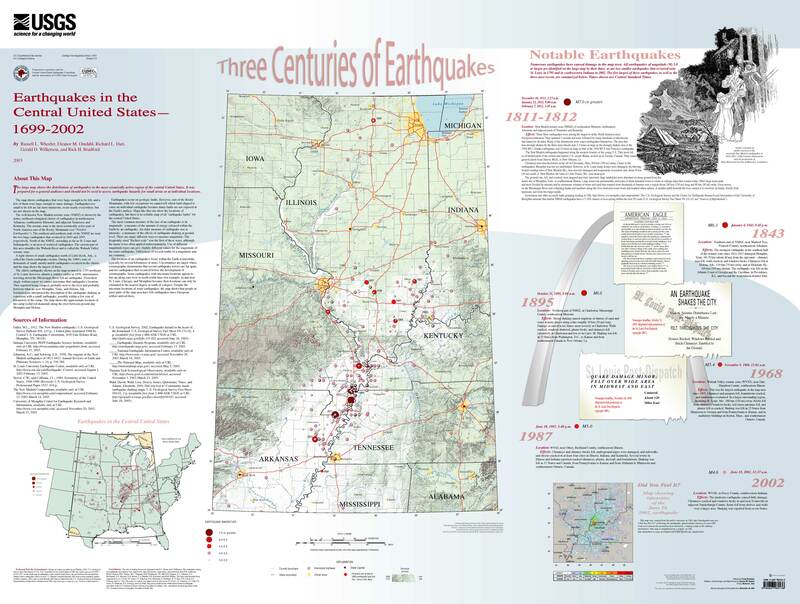 This is a slick USGS-produced poster with an overview of historical earthquakes in the New Madrid Seismic Zone. For best viewing you will want to download the file from the USGS so you can zoom in and read the text. Before you proceed, please complete the following reading assignment. Then, in the next part of the lesson, we will discuss the scientific background necessary to appreciate why there is a scientific controversy over the level of seismic hazard in the central USA. Gomberg, J., & Schweig, E. (2002). Earthquake hazard in the heart of the homeland. Fact Sheet - U. S. Geological Survey, 4. Why does the USGS produce different seismic hazard maps for different probabilities and time periods? In practice, what does this mean to you when you look at a hazard map? On the hazard map shown on page 2 of the fact sheet, why is the central USA given a hazard rating as high as that for the San Andreas fault area in California? Why is paleoseismology important in determining the seismic hazard of a region? If you have questions or comments, especially pertaining to the questions I have posed above, please post to the Questions discussion. There is nothing to submit for this assignment, but you will want to read this fact sheet thoughtfully because your final assignment for this lesson will be to rewrite and update it with new data.